Stephen and Anne's life in pink: That's magic! We had a good time in France. We went to the same holiday park we went to two years ago. 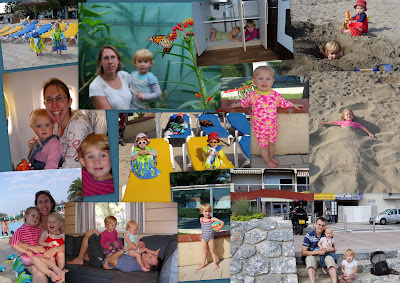 This felt a little (a lot) unadventurous, but we knew it was good, and that we and the girls would enjoy the sea, swimming pool and relaxation. Come to think of it, I don't think the girls did much relaxing. ThingTwo decided to start pushing through her canines while we were away, which messed up her sleeping a bit. That was a pain. On the last three evenings we took the girls along to the kids' show. Basically an opportunity for them to dance on stage to Europop. ThingOne loved it of course, and ThingTwo was soon getting up on stage in order to be trodden on. There was a girl in the cabin (static caravan?) opposite us about a year older than ThingOne. ThingOne spent the first day or so watching her and asking us what her name was, how old she was etc. We told her that she'd need to talk to her to find out, and when the opportunity arose we chatted to her family and found out the info for her. ThingOne was keen to make friends with this Big Girl called Beth. Eventually ThingOne summoned up the courage to approach her. For the next day, ThingOne and Beth wandered around together on the tracks around the cabins, synchronising their footsteps and giggling, but rarely talking. It took them a good day to actually talk to each other, but once they did they played together a lot. It was really nice to see as ThingOne loves older kids, and Beth's sisters were much older so she appreciated someone nearer her age. ThingTwo followed them around a fair bit, and they didn't seem to mind that. It meant Anne and I could sit and relax, whilst keeping an eye on them. They enjoyed playing by a basin with a leaking tap, which they called a well, about 100 metres from our cabin. Before we went away, I'd learnt a couple of simple magic tricks online, in order to impress ThingOne. She likes it when I do tricks and pull something out of her ear, and frequently tries to put things in there so that I can pull them out 'with magic'. This doesn't impress Anne as she can see trips to A&E ahead to get beads, stones etc out of ThingOne's ears. For holiday I wanted to do some more sophisticated tricks. I learned a couple of card tricks, but decided they might be a bit beyond ThingOne. Would she be impressed that I knew what card she'd picked? Possibly not. I stuck to the tricks where I make something disappear from my hand and make it appear elsewhere. These tricks are so easy to do for toddlers, as they're all about misdirection, and toddlers, being so easily distracted, make misdirection possible for even the most cack-handed dad. It's some way off from Derren Brown. I figure I should make the most of ThingOne being impressed with my abilities while she's still distractable. I'd tried to learn a clever and subtle way of putting a coin in one hand while actually keeping it in the other. On You Tube it looked impressive. I could never get it to look impressive, but fortunately young kids don't need the best sleight of hand to be fooled. After a few tricks around the cabin, I went for the big impressive David Blaine style tricks. Sometimes when I walked past the 'well' ThingOne and Beth played around I would drop a 20c coin in on top of the leaves that were in there (it didn't have water in it). Later I'd ask ThingOne and Beth if they wanted me to do a trick. I'd give them a bit of a show, show them the 20c coin I was holding, and it would culminate in my slamming the hand with the coin in (but not really) against our decking, saying a magic word and revealing the coin had gone. They'd run to the well, find the coin (and check that it had a 20 on, to 'prove' it was the same coin) and get excited. I let it go wrong a few times to amuse them and to give myself a get out for when I messed it up. A few times the coin didn't disappear. ("I must have said the word wrong!") Once I made the coin appear behind the well, and told the girls I must have overshot. They laughed at me. ThingOne shouted "You missed, Daddy!" as though magicking a coin 100 metres wasn't impressive if it didn't go directly in the well. What amuses me most about this is that whilst they were really impressed, and seemed to genuinely believe I had magic powers, they still go about their days without thinking I'm some amazing warlock, or suggesting I do something useful with my laws-of-physics-defying abilities. I'm partly surprised they down back away from me, terrified. How long have I got before ThingOne, and then ThingTwo, have the crashing realisation I'm not that good at magic? I'd better make this magic hay while the sun shines. I used to do magic tricks for my Turkish twins, and they were five!